The second weekly blast of heroic unveilings has emerged from Epic's upcoming Paragon in the form of Steel, a massive slab of grim-faced goon who appears as though he'll take a rather different approach to handling his problems than the last guy, Twinblast. Twinblast has a bespoke calfskin vest, Adam Jensen arms, and a pair of pistols that, while proportioned more along the lines of double-barrel grenade launchers, are probably relatively elegant as videogames go. Steel, on the other hand, looks more like a tarted-up Tychus, minus the helmet, gun, and happy disposition, and his weapon of choice as far as I can is his fist. His triple-armored, hydraulic-driven, rocket-powered fist, that is. Steel is the second of Epic's Paragon heroes to be revealed, although the studio remains tight-lipped about the game itself. Three more remain: Sparrow, Dekker, and Grux, who will be revealed in one, two, and three weeks' time respectively. 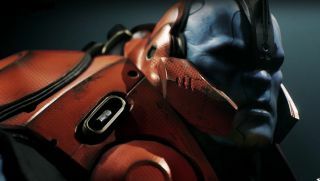 Hit up PlayParagon.com to see more and sign up for the beta. Paragon is expected to come out in early 2016.